Yes, it's all fun and games and lots of Nazis get killed; but does the world really need a World War II fairy tale? A conflict that engulfed the globe for six years surely has enough incredible stories that are real, close-to-real, or capable of inspiring sensational but still reality-based fiction, and over the years Hollywood has generated no shortage of World War II movies that cover all these various dimensions of reality, from the extremely serious to the wildly gung-ho. Still, a revenge fairy-tale in which all high-ranking Nazis, including Hitler himself, congregate at a dingy Parisian cinema only to get slaughtered and burnt to death by the combination of a rag-tag commando unit and a Jewish girl? Is this what scraping the bottom of the intellectual barrel looks like when it is packaged and polished by a high profile director with a respectable ensemble cast? From the mis-spelled movie title to some clearly derivative scenes, Quentin Tarantino is clearly not taking any of this seriously, yet the movie never quite places itself as a satire. The result is a general mis-match between intent and execution, with too many scenes played straight and asking for an emotional investment, only for the overall story arch to be just slightly short of farce. Christoph Waltz as the Jew hunter Hans Landa emerges from the chaos with a priceless performance that will long survive the memory of the movie. He is all sleazy charm effortlessly combined with ruthless fascism. His scenes have a deliciously uneasy edge and deserve to be wrapped into an entirely better and more serious film. Brad Pitt appears unsure if he is re-making The Dirty Dozen or an arts film. The rest of the cast stick closely to the first of one dimensions. 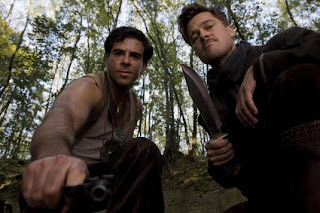 Inglourious Basterds is not short of entertainment. It is just glouriously unnecessary.